When I’m on the floor doing programs and staffing exhibits, it almost seems like everyone is sick as I hear people coughing and sneezing all around the Museum. As the winter approaches, our bodies have to adjust to the temperature changes, and the dry air can make us more susceptible to cold. It’s important to practice good hygiene skills to prevent getting and spreading the germs that cause colds. 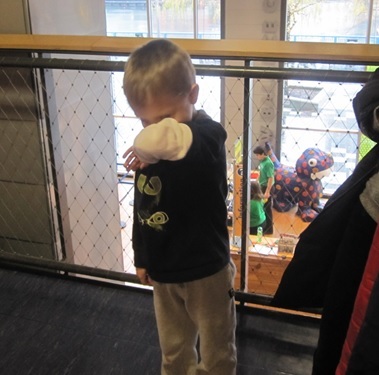 The followings are some tips to help children practice coughing and sneezing into their sleeves. You can also learn more about germs and hygiene by coming to “Germ Keep-A-Way Day” on Saturday November 28 at Boston Children’s Museum! 1. Start with modeling and directing. Your child’s favorite dolls or stuffed animals can also be good role models, with your help. When you are playing with your child, you can pretend that Mr. Bear is coughing, and Mr. Bear can hold his arm up to cover his cough. 2. Recognize when your child successfully uses their elbow to sneeze or cough. 3. Use your imagination and creativity! Learning good hygiene skills should not be stressful for you and your child. Let’s have some fun with it! Play games or make art about coughing/sneezing into sleeves. For example, you can cut off the toe part of a sock and create a “Germ Eating Monster.” Then, have your child wear it on his sleeve to feed the monster, who loves to eat germs, by coughing into his face! Of course, your child can help decorate the special Germ Eating Monster! Finally, the best way of helping to limit the spread of germs is to get rest and be thoughtful whenever you or your child are sick. While we always love seeing you at the Museum, if you think you have the flu or any contagious illnesses, please rest at home and visit when you know you can fully enjoy all the fun here! ← Indigenous Halloween Costumes: Empowering or Problematic?